I can't believe (but happy that) the week has gone so quickly! 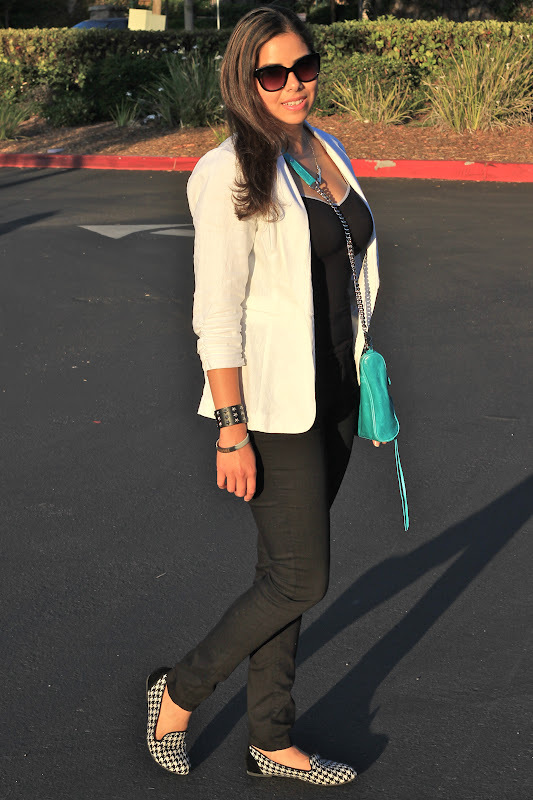 On Tuesday, I attended a volunteer orientation for Fashion Week San Diego. San Diego has been without a fashion week since 2008, so when I heard it was going to be revived this year I knew I had to be involved. After interviewing the founder Allison a few months back for Lil bits of Chic, it was so nice to finally meet her in person! She oozes the passion she has for this project and listening to her was very inspirational and motivating. My fellow volunteers were also inspirational, among them Kellyn from feNa handbags, check out her handbags they are gorgeous! For the orientation, I wanted to stay comfortable, yet chic. 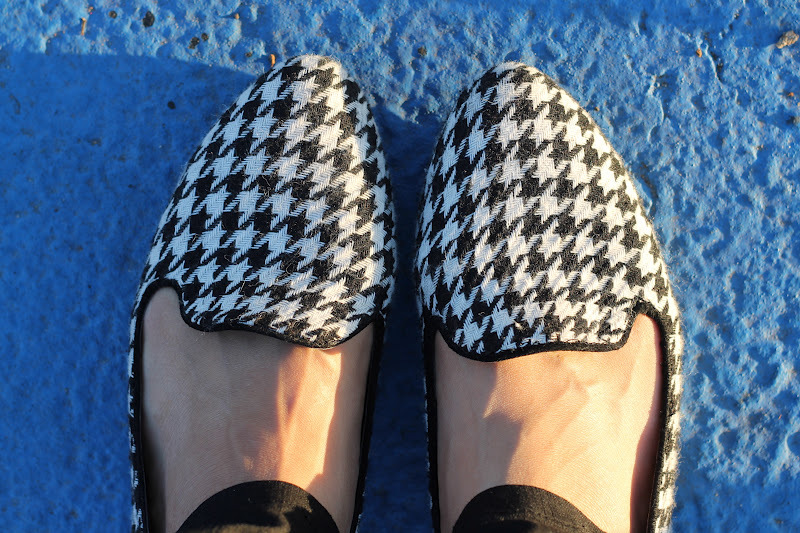 My outfit was inspired by these newly acquired houndstooth loafers that I'm obsessed with (hence the black and white). Of course, I had to add a pop of color to liven it up! ALSO, remember my Pop of Chic giveaway? 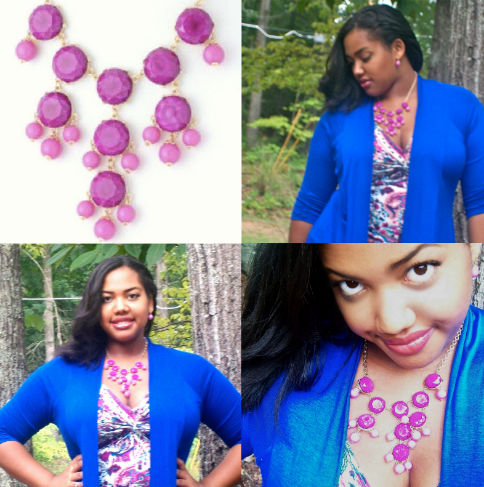 Lovely Krysten won the 'Nori' statement necklace and here she is pairing it up beautifully with a colorful floral top and a gorgeous electric blue cardigan... perfection! Thank you Krysten! Love the pop of color of the bag :) I also attended the orientation and the entire team is amazing! Buen fin de semana, Pau! Love this look! Those loafers are adorable and that bag is TDF! Love the color. I'll be seeing you at FWSD! Love this look! Great pop of color! the shoes are so cute! and looks so comfy to walk in. your shoes are sooo fun! love love! I LOVE Charlotte Russe, when I lived in America I would hit that place up all the time. You can find the best hidden gems there. You look great! 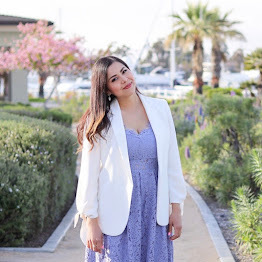 Love how you use colors in your outfits. I love your loafers and your bag! lovely shorts, those patterns are really fun! LOVE those loafers! They are just too fun. Love the loafers! What a great find. Also adoring that turquoise bag. Just stands out against the black and white. Popping over from EBEW.